The Impact Centre based out of the University of Toronto recently published their 2019 report identifying Canada’s fastest scaling private tech companies. Four out of the top ten companies on the list are based out of Montreal or have a significant presence in the city. Element AI took the top spot fueled by their $135M financing round in 2017. The Narwhal list was conceived two years ago as a way to identify companies that have the potential to scale to world-class status. According to the Impact Centre’s website, the methodology used to select the companies is based on “financial velocity” measured as capital raised over the number of years a company has been in existence. The premise behind the concept of financial velocity is that companies that have successfully navigated through the stage of validating product – market fit are only limited by the capital they have on hand to fuel their growth. The amount of capital required increases as companies grow, thus, companies in a growth phase require more capital to sustain operations. In comparison, later stage companies who are profitable would fund their growth through retained earnings. 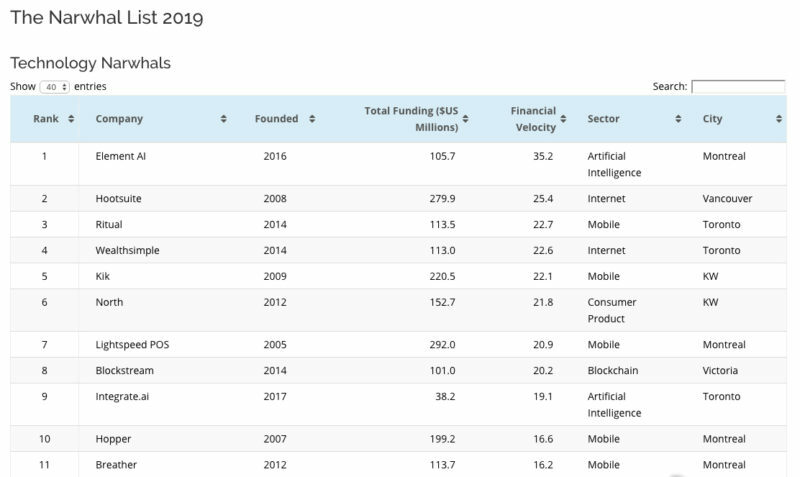 Montreal’s standing as a leader in Canadian early and growth stage venture landscape also dominates the list with 9 out of the top 12 companies having raised funding from Montreal based Real Ventures, iNovia, Investment Quebec, or Powercorp investment firms.